Buffalo Computer Graphics offers two software options for student ownship control: Virtual Steering Stand (VSS) and Virtual Steering Control (VSC). The student once given control of the Ownship can maneuver it as desired directly from either the VSS or the VSC. The student controls Ownship Speed by either a direct speed entry in autopilot mode or with throttle percentage commands in the manual steering mode. Course changes are also either direct data entry or via Rudder adjustments/commands. The VSS utilizes a dedicated monitor to display gauges, controls, and other sensor data used by the student to monitor and control his or her ownship. 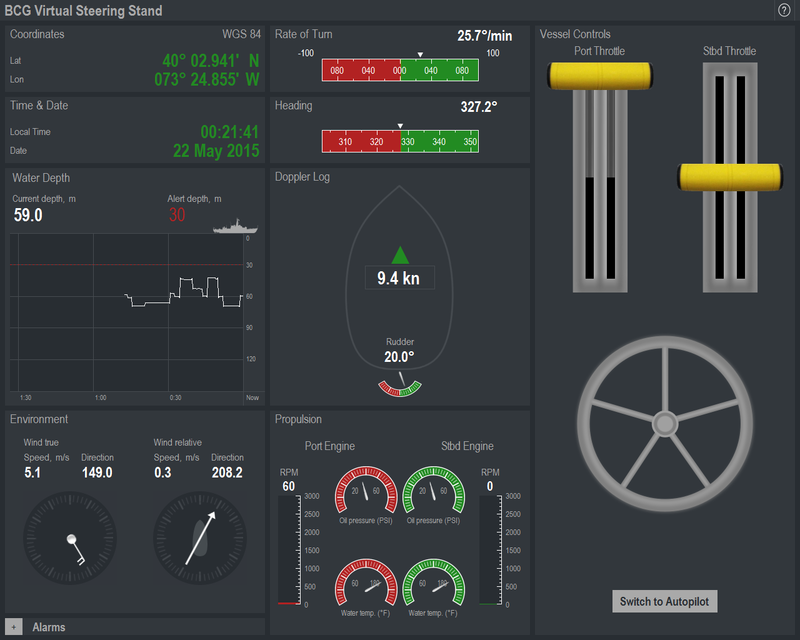 The VSC allows the student to control his or her ownship and utilizes the same monitor that the radar or chart display uses. When not in use, it minimizes to a small control bar at the top of the monitor; when needed the student can "maximize" the VSC and it only occupies the top 2 or 3 inches of the monitor. When the course and/or speed change has been made, the VSC is minimized again.